Do you have news to share with the UR Music Department community? Email Jimmy Warlick and share musical, professional, or personal news. 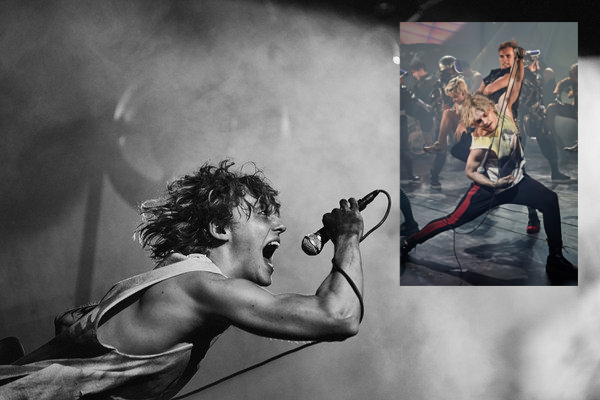 Andrew Polec (BA '12) is the lead in a new musical entitled Bat out of Hell, which is in previews at the Birmingham Opera House in England and will open at the London Coliseum in June 2017 on the West End. The show features music and lyrics by Jim Steinman (who also wrote the book), which were first made popular as performed by Meatloaf. Press for the show calls it "a romantic adventure about rebellious youth and passionate love, set against the backdrop of a post-cataclysmic city adrift from the mainland." Andrew plays Strat, "the forever young leader of The Lost, [who] has fallen for Raven, daughter of Falco, the tyrannical, ruler of Obsidian." Andrew is an alum of the Musical Theater Workshop and our Rock Repertory Ensemble. Alumnus Dan Israel (BA '05, KEY '06) is featured in the Spotlight on Humanities Alumni profile in the Buzz. Nawa Lanzilotti (BA '11) completed the Masters in Ethnomusicology at Eastman in 2012 and presented part of her thesis, focusing on the musical experience of Deaf students in Rochester, at the Society of Ethnomusicology conference in 2011. For the past few summers, she has been in Hawaii playing cello with slack-key guitarist Danny Carvalho. Last September, Nawa moved to India to study North Indian classical music on Indian cello in New Delhi. She returned to India at the end of September 2013 on a performing arts scholarship from the Indian government. Stephen Frank (BA '07) is the Studio Manager and Director of Licensing for Selectracks, which is the production music division of Bug Music, Inc., the largest independent music publisher in the world. In addition, he is the co-owner of an independent record label. Stephen currently performs his own creations with a group called Tek SubPort, a live electronic music duo that blurs the lines between performer and DJ. Over the past couple of years, Stephen has built a studio where he creates, mixes, and masters his music. In his spare time, Stephen has also been designing his own custom performance machine using music software and midi controllers. Dan Israel (BA '05, KEY '06) runs a jazz talent agency in New York City and also recently presented an hour-long preview of his original musical The Dirty Hippie Jam Band Project at the Jerry Orbach Theater in the Snapple Theatre Center. The Dirty Hippie Jam Band Project tells the story of a group of modern-day hippies who follow their favorite band (Liquid Brick) across the country. Dan is collaborating on this project with lyricist Phoebe Kreutz and librettist Adam Mathais. On May 10, 2010, Dan was awarded the BMI Foundation's Harrington Award for Outstanding Creative Achievement in Musical Theatre. Dan was also recently featured in an issue of BMI Bulletin. Cory Clines (BA '01) performed his first Mozart role in April of 2010-- The Abduction from the Seraglio. The opera was presented by Liederkranz Opera Theatre in New York City. Jennifer Behnke (BA '00) is presenting a voice recital on March 21, 2009 entitled Upon the Threshold Full of Dust: reflections, renewal, and rebirth. The performance will take place at 2pm at St. Matthew Trinity Lutheran Church in Hoboken, NJ, and will feature UR alumnus Eric Hunter (BA '02) on piano. The recital will feature a collection of sacred and secular poetry dealing with themes of mourning and the bright promise of rebirth and renewal. Works by Bolcom, Brahms, Korngold, Quilter, Previn, Strauss, Wagner, and Wolf. Eric Hunter (BA '02) recently finished a residency at the Banff Centre and moved to New York City to accept an accompanying position at the Mannes School of Music while also preparing numerous concert works for piano, including an all-Liszt program. Jeremy Rothman (BA '99) is the new Vice President of Artistic Planning with the Philadelphia Orchestra. He and his wife have one son (Evan, 2 1/2), and are expecting baby #2 very soon. Richard Mook (BA '99), a recent Ph.D. recipient in musicology from the University of Pennsylvania, has published an article in the Nov. 2007 issue of the Journal of the Society for American Music: "White Masculinity in Barbershop Quartet Singing." He is on the faculty of Arizona State University. His research on barbershop singing was awarded the Lise Waxer Prize of the Society for Ethnomusicology. Michelle Nguyen (BA '98, ESM MA '03) is living in Pittsburgh, PA where she teaches piano, chamber music, and music theory at a private music school. In April 2007, she married Kevin Bitler in Rochester, NY. With Danny Jenkins (ESM PhD '07) conducting, members of URSO provided beautiful music for the wedding ceremony! Michelle and Kevin are enjoying life as newlyweds in PA. The Dubuque Symphony Orchestra recently announced the appointment of Matthew Beecher '00 as principal horn. Todd Florin, MD, '00, is currently a resident in Pediatrics at The Children's Hospital of Philadelphia and Instructor of Pediatrics at the University of Pennsylvania School of Medicine. While pursuing his residency, Todd is maintaining his professional musical interests as a principal conductor with the College Light Opera in Falmouth, MA and as a singer with Vox Ama Deus in Philadelphia, PA. Todd has also published and taught on the various interfaces between medicine and music. He recently was married to singer Kemper H.L. Florin (MM, ESM, 2005), and they happily reside in Philadelphia. Stephanie Dyson '99 went to law school after finishing at Rochester, and now owns her own immigration law practice in Boston, Massachusets; however, one day she hopes to go back to the musical side of life! Things are going well for Elias Axel-Pettersson '03. He graduated with an MM degree in piano performance from the University of Maryland- College Park in 2005. He was is New Mexico during the summer of 2005 for the semi-final and final rounds of the Santa Fe International Piano Competition. Elias is also preparing for a benefit concert at his synagogue in Albuquerque in September. Jennifer Ryan '96 will be working at Grinnell College in Grinnell, IA as a lecturer in African-American literature and Gender and Women's Studies for the 2004-2005 academic year. She recently earned a PhD in English, and hopes to land a permanent teaching job next year in either the Chicago or central Wisconsin areas. Jennifer currently lives in Waterloo, IA. Her husband is a librarian at the University of Northern Iowa. After graduating from the U of R with his BA in Music, Matthew Beecher '00 moved to Madison, Wisconsin to pursue a MM in horn performance. Matt is currently working on a DMA in horn performance, and has been performing professionally with a number of regional orchestras and school ensembles in Madsion. Benjamin Drew '01 is living in the 16th District, Paris, France, and is enjoying exploring the city and living the "Parisian life." Last year, he received his Master's in French literature with honors from the University of Rennes. He has since started a "DEA" program (the equivalent of first-year doctorate work) in social-cultural history at the University of Paris-Pantheon-Sorbonne, researching the phenomenon of Americanization and the influx of American culture in France during the 1920s. Ben is also teaching English at the University of Paris. Allison Scola '94 recorded a six-song CD, Staying Right Here, in 2001, and is currently "shopping" a three-song demo CD to major record labels. She has performed live at some legendary New York City hot spots, such as The Bitter End. Scola's music has been compared to Carole King, Burt Bacharach, and Ben Folds. Also influenced by her background in theater at UR, she finds herself listening to a lot of Cole Porter and other American standards from the early 20th century, as well as the Beatles and early '80s pop music. Scola is working to gain fans "one at a time" through continued live performances and by making songs available on her Web site (www.allisonscola.com). In the meantime, she works as admissions director for the Mannes School of Music, part of the New School, and spends most of her free time performing in New York and Connecticut. Thomas Vaniotis '03 was accepted into the graduate choral conducting program at New England Conservatory in Boston, and instead decided to defer entering a graduate program to work at Framework, Inc. At Framework, Thomas is employed in the software quality assurance department. He lives in Ossining, NY and continues a regimen of piano lessons and academic reading in the areas of music history and theory. In a few years, Thomas plans to apply for a Ph.D program in musicology.